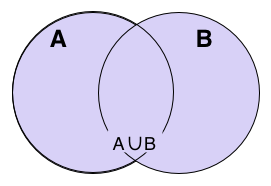 When I was an elementary teacher, I used the Venn diagram to teach the set theory showing the relationship between two groups of objects, numbers, concepts, etc. The other day when I read “Jesus Calling” about our relationship with God, I thought of a small circle with me in the center. Then another with God in the center. I placed the God circle so it would intersect the me circle. Part of me intersects with the God circle. But I’m holding back the rest of me and not allowing God in. I need to “erase” the two lines. Not only that, I need to move the me circle all the way into the God circle. And of course that circle is infinitely larger than the minuscule me circle. As large as infinity. No man could draw it. I’m wondering how many of us intersect with God but hold back a portion of ourselves. Let’s erase any barriers that keep us from the Lord. Let’s live in perfect union with Him. If anyone would come after me, he must deny himself and take up his cross and follow me. For whoever wants to save his life will love it, but however loses his life for me and for the gospel will save it. Mark 8: 34-35.